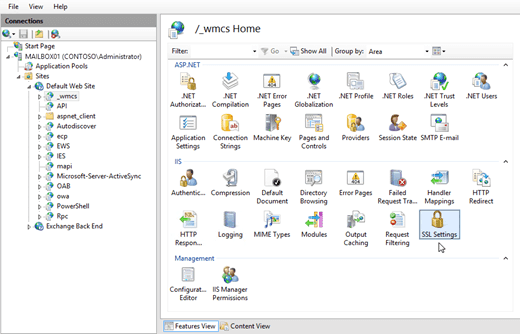 Many administrates need to learn how to redirect owa to https exchange 2016, as the exchange server 2016 redirect https://mail.contoso.com to https://mail.contoso.com/owa. If you try to preview http://mail.contoso.com nor https://mail.contoso.com/owa you will get problem and will not redirect to the owa correctly. I this Article you will learn step by step how to redirect owa to https exchange 2016. 1. 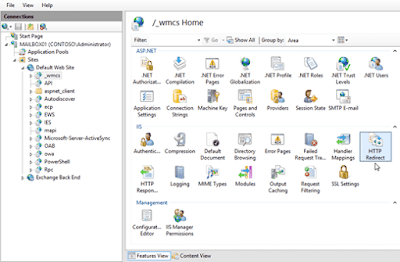 Open IIS Manager on the Exchange server. An easy way to do this in Windows Server 2012 or later is to press Windows key + Q, type inetmgr, and select Internet Information Services (IIS) Manager in the results. 2. Expand the server, and expand Sites. 3. Select Default Web Site. and verify Features View is selected at the bottom of the page. 4. In the IIS section, double-click SSL Settings. 5. On the SSL Settings page, clear the Require SSL check box, and in the Actions pane, click Apply. 1. In IIS Manager, expand the server, expand Sites, and expand Default Web Site. 2. Select the virtual directory, and verify Features View is selected at the bottom of the page. 3. In the IIS section, double-click SSL Settings. 4. On the SSL Settings page, select the Require SSL check box, and in the Actions pane, click Apply. 5- Repeat the previous steps on each virtual directory in the default website that had Require SSL enabled by default (except for /owa). The only virtual directories that don't have Require SSL enabled by default are /IES, /PowerShell, and /Rpc also. You will now write the link of the owa inside HTTP Redirect Field. 1. In IIS Manager, expand the server, and expand Sites. 2. Select Default Web Site. and verify Features View is selected at the bottom of the page. 3. In the IIS section, double-click HTTP Redirect. 5. Select the Redirect requests to this destination check box, and enter the value https://mail.contoso.com/owa. 6. In the Redirect Behavior section, select the Only redirect requests to content in this directory (not subdirectories) check box. 7. In the Status code list, verify Found (302) is selected. 8. When you are finsihed those steps please click on apply int the Actions. We enabled the redirection on the IIS in the last step, So all the setup will be inherited by all the vritual directories inside IIS. currently we will work to remove redirection from all the virtual directory under the main Defualt Web Site Directiory. 4. On the HTTP Redirect page, change the following settings. 5. Clear the Only redirect requests to content in this directory (not subdirectories) check box. 6. Clear the Redirect requests to this destination check box. 7. In the Actions pane, click Apply. 8. 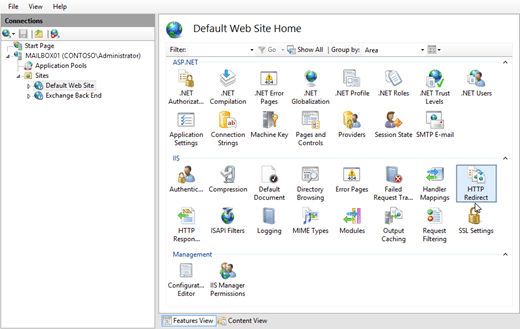 Repeat the previous steps on each virtual directory in the default website. 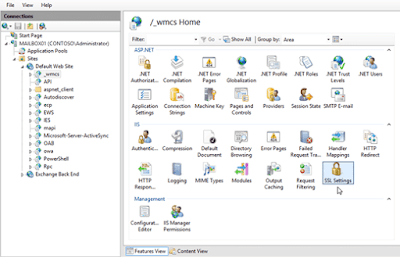 We need now to restart IIS Manager from the left side panel by selecting the server and after that from th Actions click on Restart. The default Require SSL and HTTP Redirect settings for the default website and all virtual directories in the default website on an Exchange 2016 server are described in the following table. If you are not success you need to check the steps of how to redirect owa to https exchange 2016 another time. As you see all thing is simples and in pictures and you can apply all the steps above to make your owa (Outlook Web Access) redirects correctly to https. If you need any help please don't hesitate to contact us or comment below and i will see your questions and make the best for you.